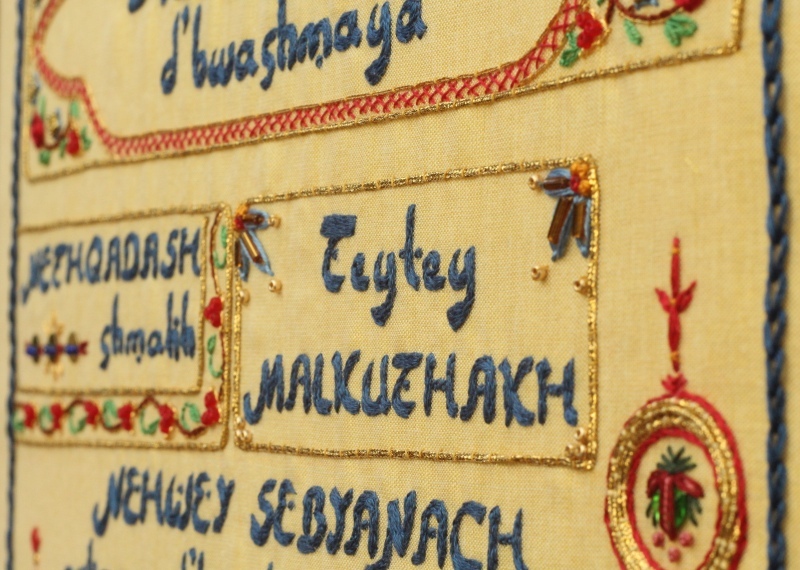 This, then, is the Aramaic Lord’s Prayer panel, now that it is completed. 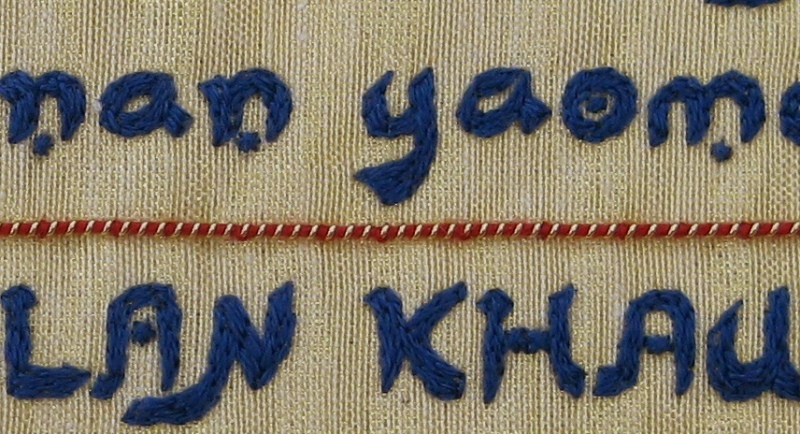 For those of you who like to know these things, I estimate that it took about a week (on and off) to design it, 45 hours to stitch all the blue lettering, and about 120 hours altogether to make this panel. The frame measures 16 inches by 20. I decided not to use the glass that came with the frame, so that the beads, gold braid and padded areas wouldn’t get crushed. 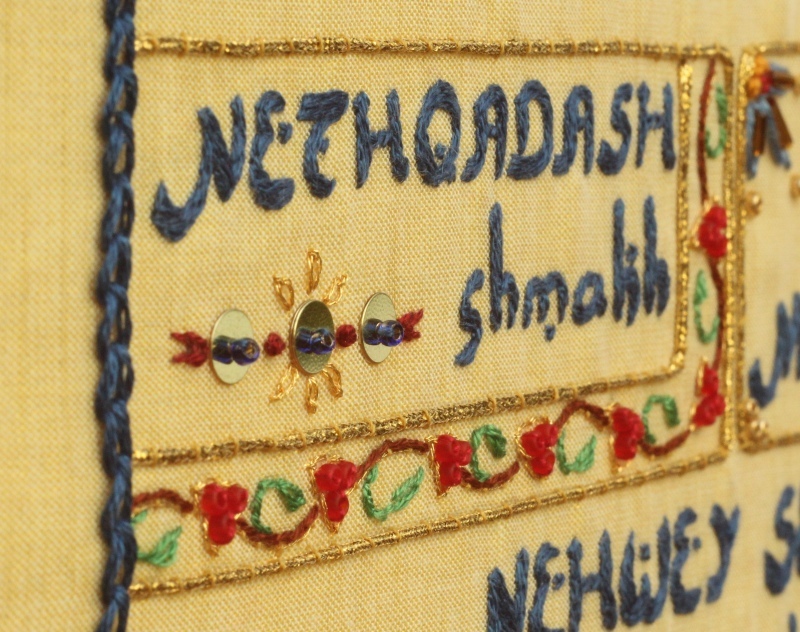 A layer of two ounce wadding beneath the stitching gave the embroidery a nice ‘slightly padded’ look, when it was mounted. Here are some detailed photos that my husband took, when the piece was finished – his camera can take much more detailed images than mine can! 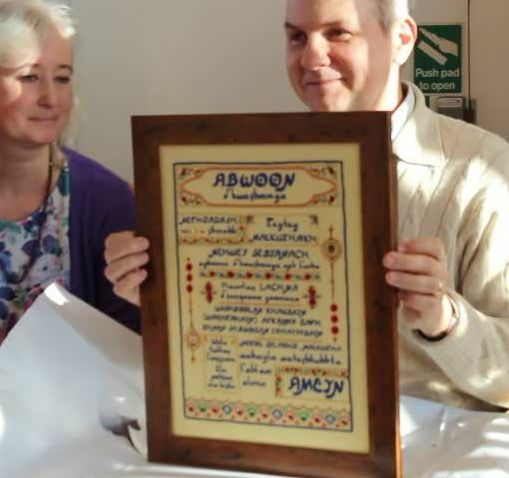 If you’d like to find out more about Neil Douglas-Klotz’s work on the translation of the Lord’s Prayer from the original Aramaic, he has a website at www.abwoon.org , where information about all his books, audio courses, music and other information about his work as an independent Biblical scholar can be found. There is also a page where you can learn to speak the Prayer of Jesus in Aramaic, line by line here. 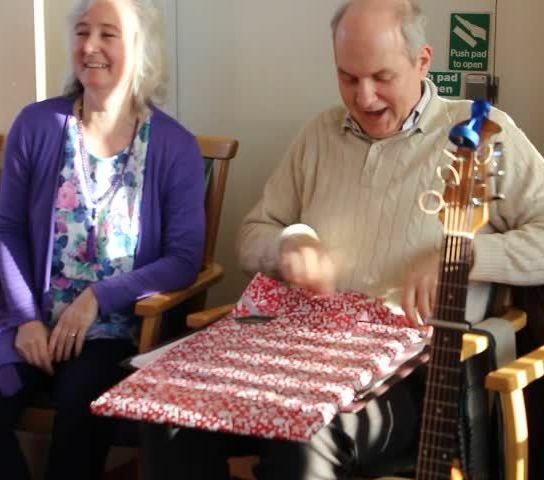 There are many more videos like this on Neil’s website. 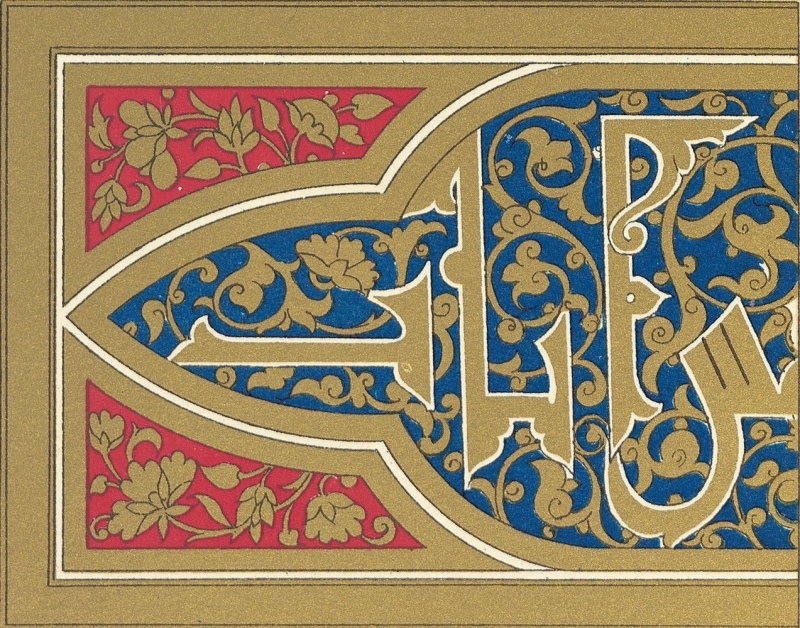 This is the original design I chose from the ‘World of Ornament’ book to run along the bottom edge of the Aramaic Lord’s Prayer panel. It is Moorish-inspired. I wanted a repeating pattern that wouldn’t be too difficult to render in embroidery, but which would give the look of a wide solid line to the base of the panel when viewed from a distance, to ‘ground’ the whole piece. I knew I would have to eliminate quite a lot of the detail, in order to stitch the design. Those little white dots would have to go, for a start! I worked out a repeating pattern for the colours I wanted to use, and stitched the basic lotus-shaped areas first. Then I edged the circles with Coats Ophir thread, in one continuous line from left to right going over and under the shapes, then back the other way from right to left, completing them. The original design had quite a ‘coloured in’ background,and I wanted to give the effect of this without doing some really dense stitching such as long and short stitch, for instance. So, I stitched a line of buttonhole stitches along the top edge in Thread Gatherer Silk ‘n’ Colors 1027 Leprechaun, altering the length of each stitch to fill the gaps between the circles. Along the bottom edge, I attached clusters of three red beads. A size 11 gold sead bead finished off each of the lotus flowers. 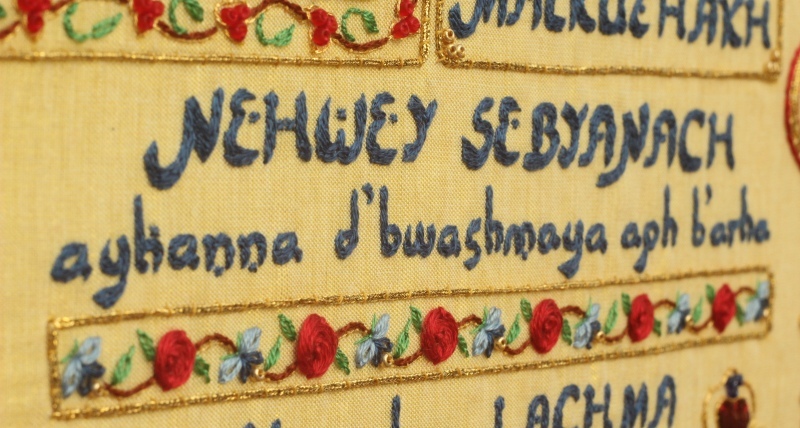 As you can see, it doesn’t have many colours to it, but I wanted the colour selection for the embroidery to blend in with the other borders in the panel – so, it would have red and blue flowers, along with gold highlights, like the other borders. I found some sweet little spacer beads in my beading stash ( I do beading, too – maybe one day I’ll show you…), and I felt that these would make very nice ‘flower centres’. 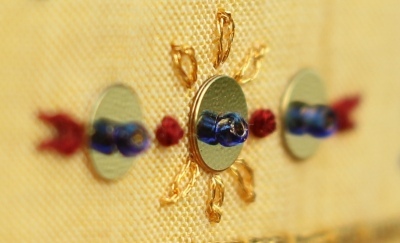 I attached the spacer beads with Guterman thread, then stitched individual fly stitches around each of the five sides of each bead, with one strand of light blue Anchor thread. The rest of the leaves and flowers were made from lazy daisy stitches and fly stitches. The stem was one strand of 352 Dark brown Anchor stranded thread, highlighted with couched Coats Ophir thread alongside, as in the other borders. Couched Kreinik braid #16 around the edge completed the area. For the final outline around the whole panel, I had various options. I had considered quite complicated bands of couched gold, red and blue, for example. 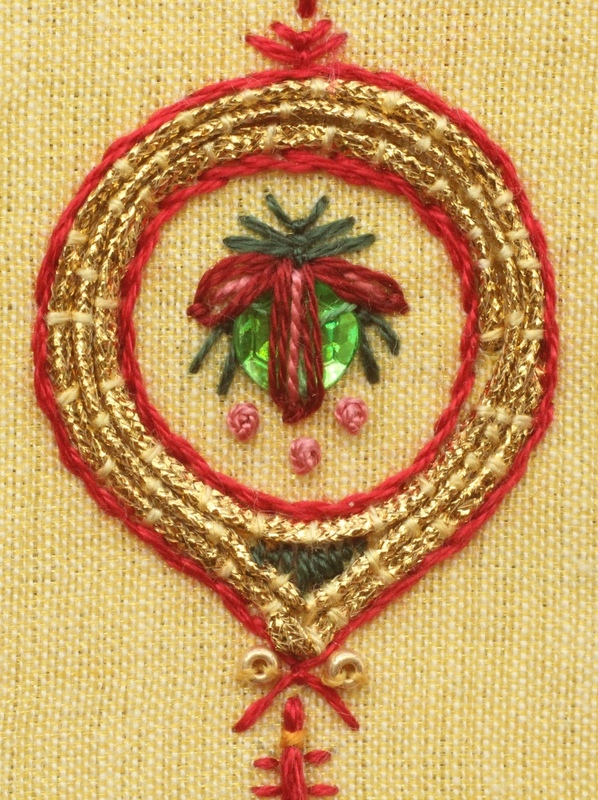 or heavy stretched pearl purl intertwined with red thread (to echo the band across the centre of the panel). 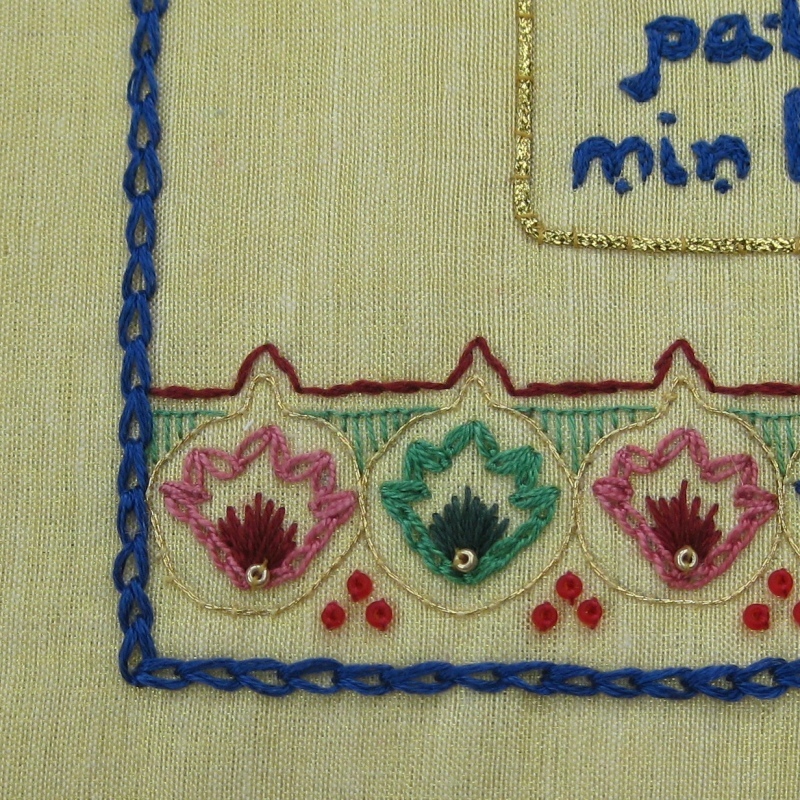 Or even appliqued red kid pieces at the corners, with complicated linking bands of various stitches in between. But when I looked at the almost-finished panel, I felt that it was quite busy enough, and only required a simple finish. 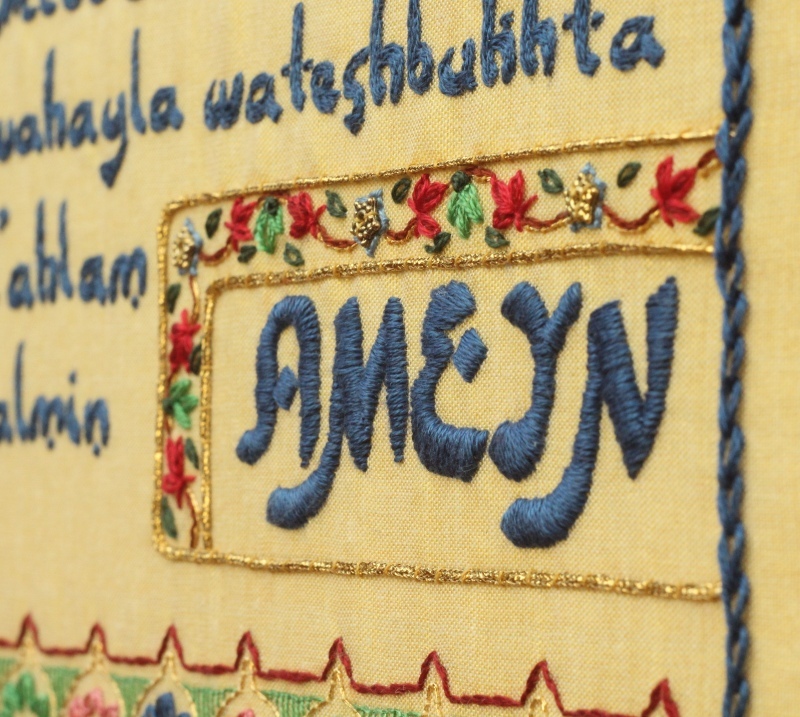 Also, the idea of chain stitch appealed to me, as it was a simple ‘link’ around all of the words, expressing the idea that the whole Prayer can provide a link between our everyday lives and the sacred. 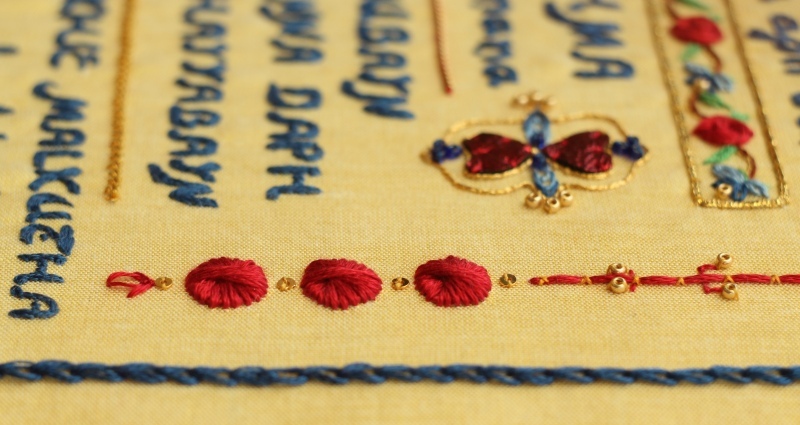 So, eventually the outer border was stitched with four strands of Anchor stranded thread 152 Navy, in chain stitch. Then came the bit I don’t like doing….I had to finish it all off. I usually rush the finishing part of any project, as I don’t have the patience to slow down and do it all properly, but it was important to me to get this right, as it’s a present for my Sufi teacher. I cut the fabric from the frame, and debated with myself whether or not to risk ironing it from the reverse side. I decided against it, as the gold thread and the beads might not have liked that! 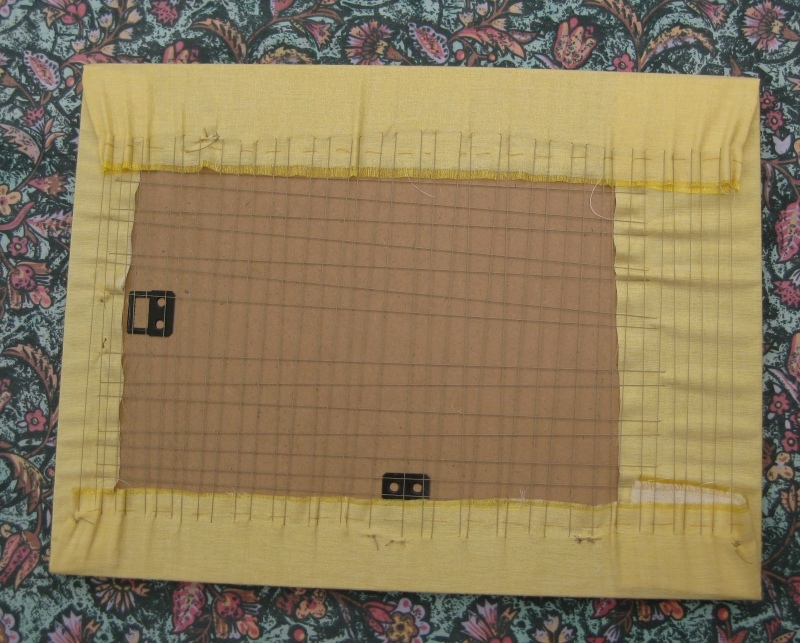 I trimmed the muslin backing fabric and the yellow silk down until they were both about three inches wider on each side than the backing board itself. I cut the backing board slightly smaller than it was when I bought it as an insert in a frame, as I wanted the double layer of fabric, once mounted on the board, to not pucker up when I put it into the frame, but to sit quite loosely. I discarded the glass that had come with the frame, as I don’t like embroidery to be squashed behind glass. It makes the embroidery lose its tactile quality. 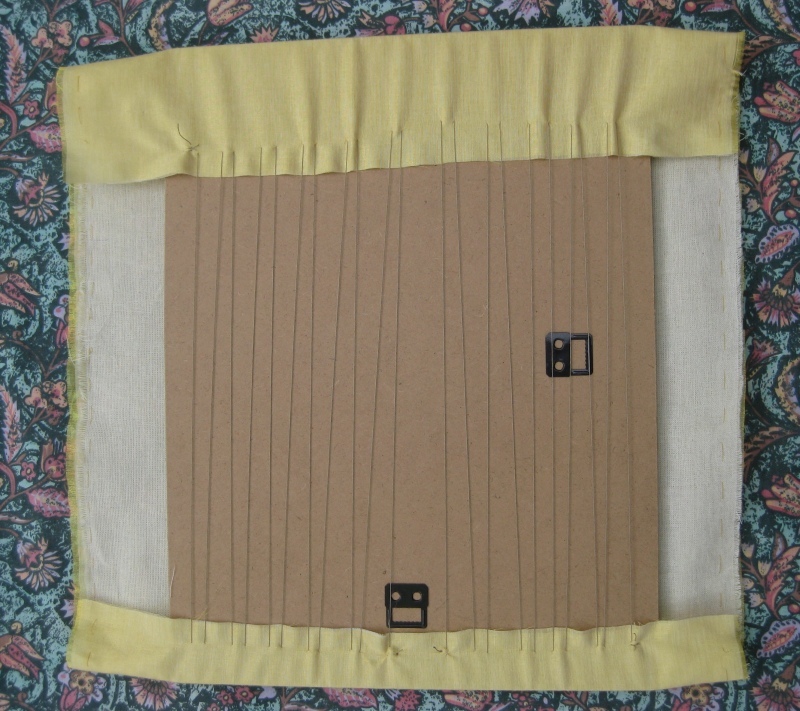 Before lacing the stitching to the board, I cut a piece of two ounce wadding, half an inch smaller all round than the mount board, and fixed it in place with strips of double-sided tape, so that the finished stitching would be slightly padded in the frame. To lace the fabric to the board I used Coats perle no 12 thread, as it is very strong. I laced the fabric (both layers at once) top to bottom first, making stitches every half inch or so, and only gently pulling the thread as I went. Then I went back over the lacing, pulling really tight after making all the stitches, and holding the lacing down with my thumb after each tug, to keep the perle thread tight until the very last stitch, when I could fasten off really securely. Then I repeated the procedure going from side to side across the panel. This is how I dealt with the central area of the Lord’s Prayer panel. Three of the lines from the middle of the panel needed visually separating, so that it was easier to read. The space was only narrow, and I considered various embroidered treatments, such as lines of couched beads, bead-and-sequin combinations, and so on. But in the end I decided to keep it simple. 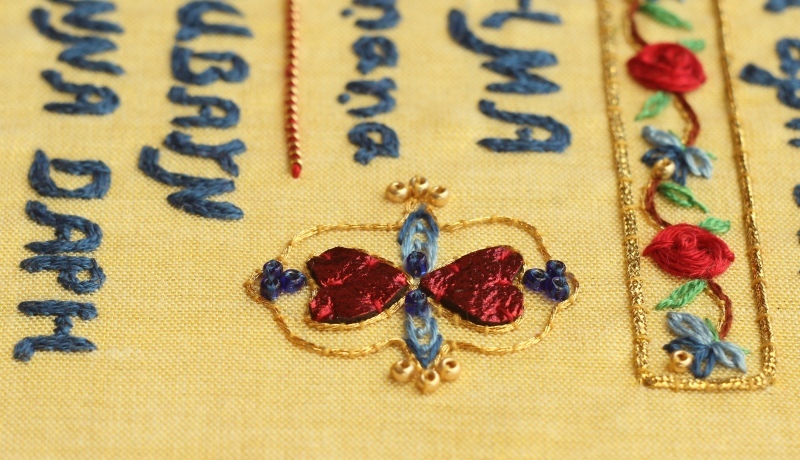 I’ve had some lovely goldwork threads in my stash for years, always hanging on to them ready for that ‘special project’. Well, this was such a project. For the first separation line, I used a piece of pearl purl gold wire from Golden Hinde (a really good UK goldwork online supplier). I cut a piece of wire half the length of the line I wanted to cover, and then gently pulled the wire from both ends, stretching the coils so that they ended up being a wavy line of wire rather than a stiff coil that looked more like a line of gold beads. I trimmed the length to exactly the size I needed. Then I took a six-strand length of Anchor 1006 Red and wound it carefully into the ‘dips’ in the gold wire, making the wire now have a striped appearance. I left about six inches of thread at each end, to allow for attaching securely to the back of the fabric. I attached both ends quite tightly, and then used one strand of the 1006 Red to couch every third coil down, stitching at an angle so that the couching stitches didn’t show. For the next separation line I used a piece of milliary wire, which is a twisted wire with an added edge of little triangular trim, which is really pretty. I couched this down with Guterman thread, with the triangles facing downwards. I wanted the ‘Wela tahlan’ area to have a very ‘light’ touch, as far as the decoration was concerned. 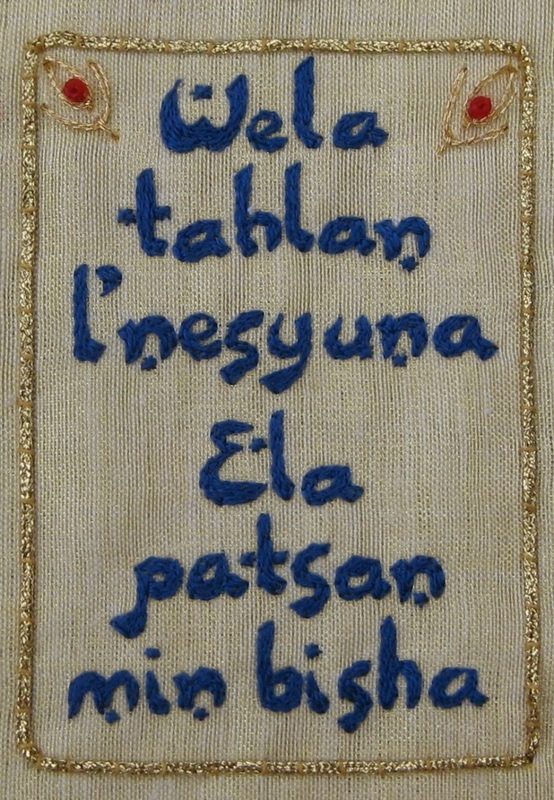 This is the line that is usually translated ‘Lead us not into temptation, but deliver us from evil’, but a translation from the Aramaic would be something along the lines of ‘Don’t let us enter forgetfulness; the temptation of false appearances’, or ‘Don’t let surface things delude us, but free us from what holds us back’. 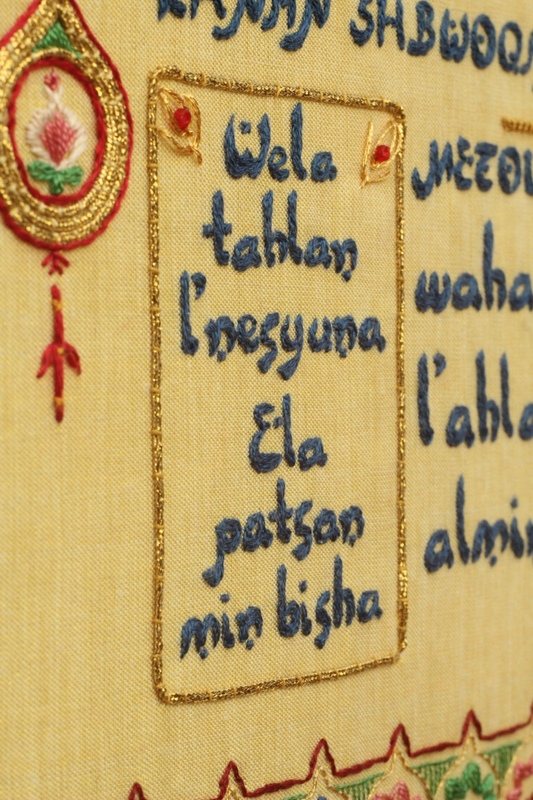 I wanted to give the impression, through the embroidery, that simple presence is what is needed to not ‘forget’ the sacred in everyday life. So, I decided to just put tiny decorative elements in the top corners of the box – lazy daisy stitches in Coats Ophir thread, with a single fly stitch underneath, with one bright red bead as a highlight, in each corner. That’s how simple it gets! 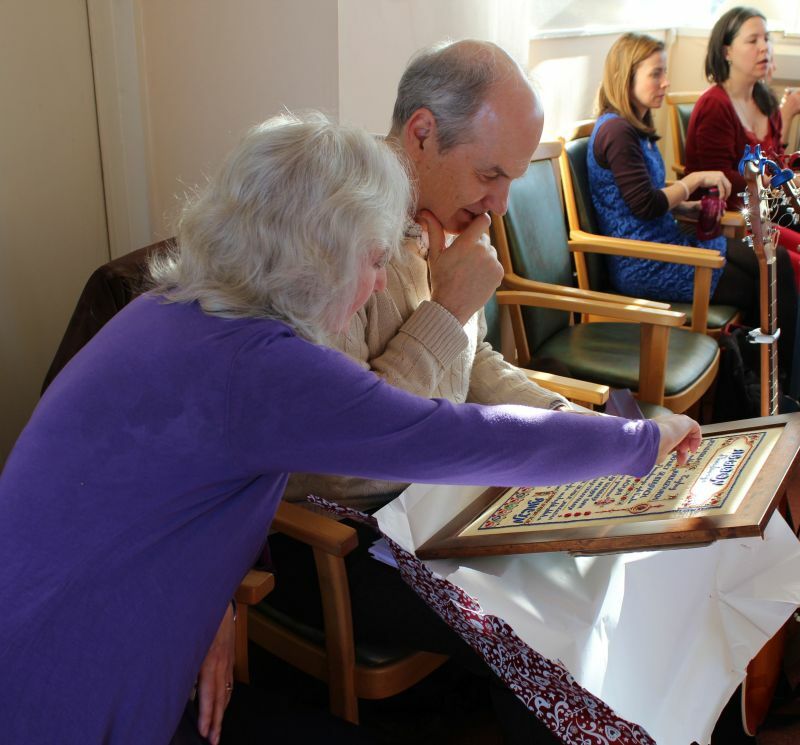 Create in me a divine co-operation – from many selves, one voice, one action. As we find your love in ours, let heaven and nature form a new creation. 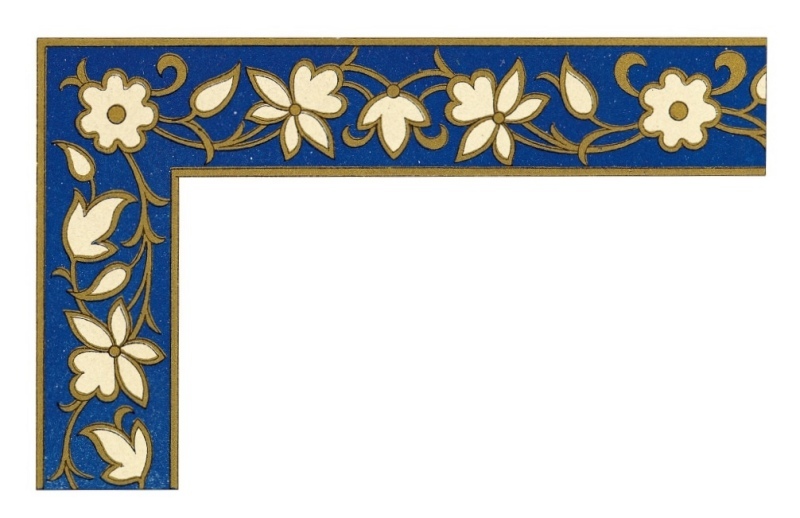 I used this Moorish border design for the inspiration for this part of the panel. I liked the regularity of it, and the way it seemed to suggest two distinct parts – the circles, and the leaves (the ‘heaven’ and the ‘earth’). I interpreted the border by stitching wound thread roses for the circles, and lazy daisy stitch flowers in shades of blue (they were meant to be leaves, but I like using blue more than green!). The stems are one strand of Anchor stranded 352 Chestnut brown worked in stem stitch, highlighted with a single line of Coats Ophir gold, couched down with Guterman thread. I was contemplating adding a busy French knot background to make the whole section look more blue, but decided when I got this far that it looked ‘finished’, so I just edged it with Kreinik #16 braid. O Thou from whom the breath of life flows and is present in all forms of vibration and light. Radiant One: You shine within us, outside us – even darkness shines – when we remember. O Thou! The Breathing Life of all, Creator of the Shimmering Sound that touches us. I used an Islamic cartouche design as the basis for this part of the panel. I wanted it to have the *feel* of a detailed cartouche, but without having the centre part too busy – otherwise, the lettering wouldn’t be readable. I debated whether to apply red fabric ‘triangles’ (well, sort of triangles!) to the corners first, and then embroider on top of them, but I rejected that idea. 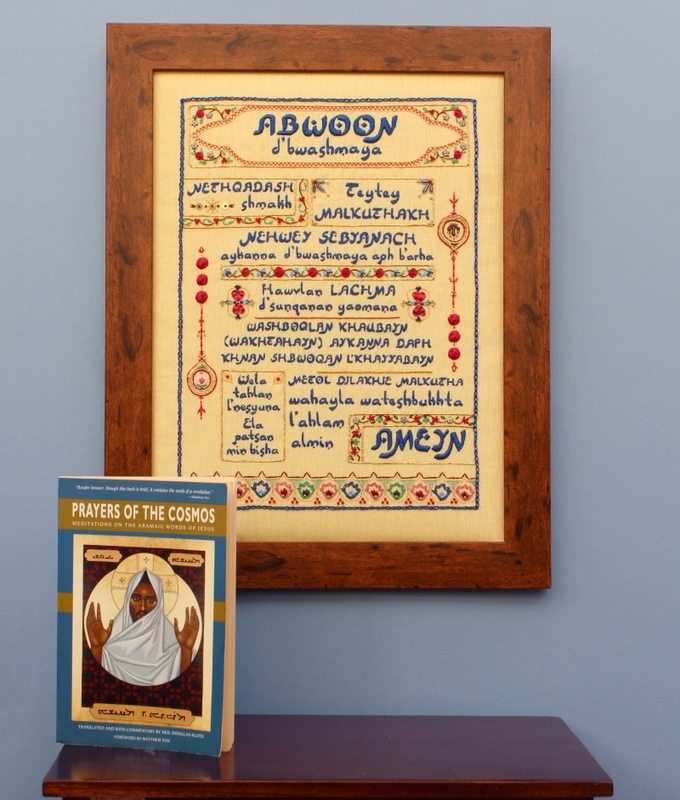 In Middle Eastern prayers, it is a tradition that the first word of the prayer encapsulates the whole of the rest of it, and this is the case with the Lord’s Prayer, when read in the Aramaic. 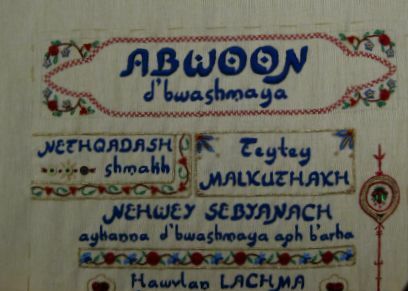 Each letter, to Aramaic-speaking people, had a ‘character’ or meaning of its own, so the word ‘Abwoon’ was more like a whole sentence to them, expressing the whole prayer. 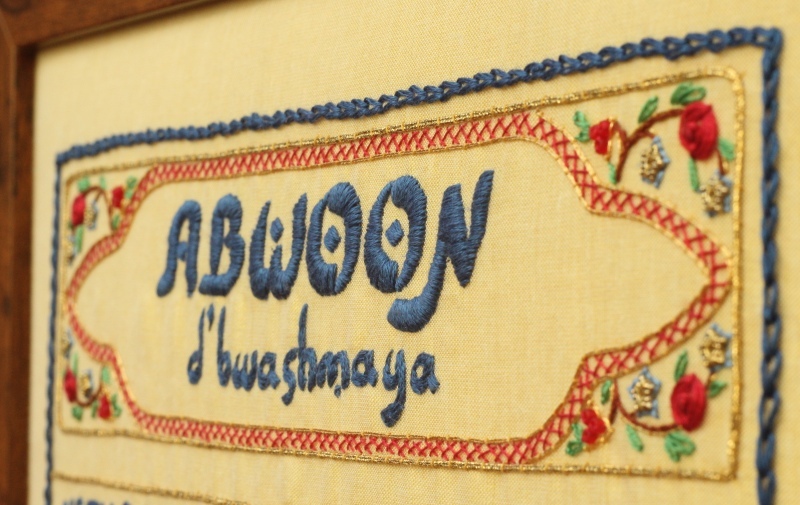 As the word Abwoon was supposed to represent the prayer as a whole, I wanted to do the equivalent of this through my embroidered representation. So, I decided to take design elements from the rest of the panel, and incorporate them into the cartouche. I did this by taking the floral elements from the borders around some of the lines further down the panel, and using them to make flowery corners for the cartouche. 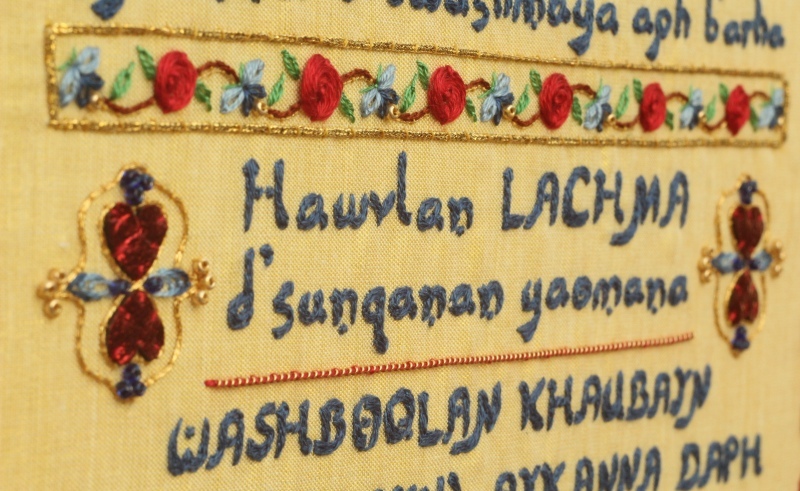 I used Carolyn Pearce’s style of wound roses from the centre ‘ribbon’ design of the panel, ‘three-red-bead’ flowers from the border of the Nethqadash area, and the spacer bead flowers with blue lazy daisy edges from the ‘Ameyn’ area. I felt that this gave the feeling of representing the other parts of the prayer at the beginning, in the Middle eastern style. I stitched a long band of herringbone stitch with one strand of Anchor stranded cotton 1006 Red around the inner border of the cartouche, and then edged this with Coats Ophir thread (two strands) couched down with the Guterman thread. 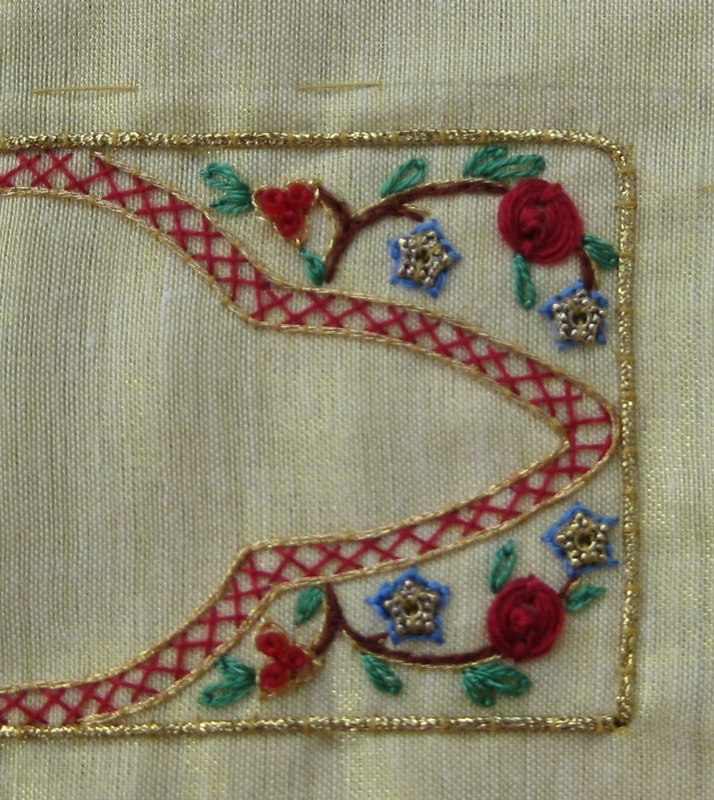 The very outer border was couched with Kreinik #16 braid. I was very pleased with how this part turned out – it made the whole panel look much more substantial, and using elements from other parts of the same panel started to pull the whole thing together.